Downsview derives its name from prominent Downsview early settler John Perkins Bull’s farm, Downs View. The Perkins home was the location for many civic activities. After his marriage in 1844, John opened his house for religious services. As a Justice of the Peace for over thirty-five years, he was known as “Squire Bull” and court was held in his house and the jail was in the cellar. Later, Bull built a courtroom on the southwest corner of his verandah. It was in Bull’s orchard that parties were held following school tests. He entertained generously, serving cakes, pies, sardines and poultry. He joked that “If a keen appetite be peculiar to children, we might infer that second childhood was overtaking many adults.” After the feast, races and games were held in the orchard. There were a number of other interesting early Downsview personalities. 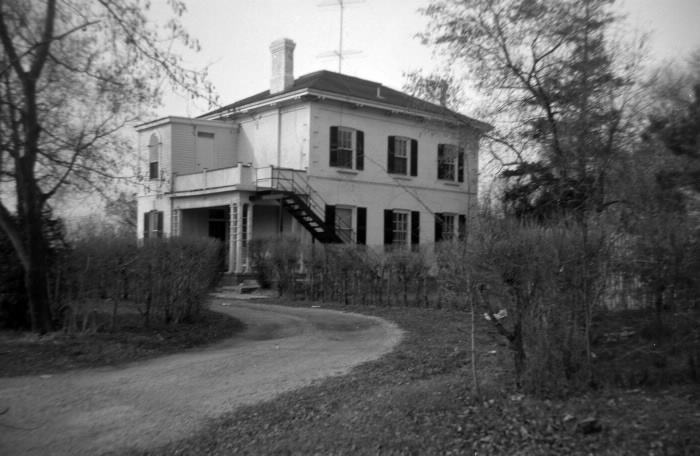 James Carruthers built his house on the southwest corner of Dufferin Street and Wilson Avenue, calling it Petherhill Farm, after the family home in England. It was noted for its large living room, 32 x 27 feet (9.75 x 8.22 meters). The huge fireplace was equipped with a crane to hold iron kettles used for cooking. Three Griffith brothers from Ireland, Matthew, Thomas and Joseph and their brother-in-law Abraham Welsh, created farms west of Jane Street near Wilson. Each built a log cabin. Later Matthew built a 12 room house with bricks made in the Humber Valley just north of the house. The walls were 2 feet (61 cm) thick. Thomas built an 11 room “rough cast” house and Joseph a house of stone hauled from Black Creek, also with 11 rooms. His house was later replaced by Workmen’s Compensation Board buildings. All told, between 1823 and 1878 the brothers owned 1,000 acres (404 hectares). James Stewart, an Irishman, farmed on the east side of Dufferin above Wilson, starting in 1831. He contracted with other settlers to cut wood on their property, haul it out of the woods and pile it near the road. In winter, he supplied fuel to King’s College (later known as the University of Toronto), Osgoode Hall and Upper Canada College. In this way his hired help, oxen and horses, used on his farm in the summer, were also gainfully employed in winter. Askelon Raynor, a blacksmith by trade, leased the toll-gate at Wilson and Dufferin. His wife was responsible for collecting the toll, while he ran his blacksmith business. People who lived north of the gate, and were unhappy about the toll, evaded it by tying their horses up the road, then walking through the gate without charge, carrying any equipment that needed sharpening or repairing to the shop. Mrs. Raynor had her own rules of business. She refused to collect tolls on Sundays because she wanted that day to herself and refused to stay up past her bedtime. The toll-gate was closed in 1891 because the plank roads were in a bad state and the railways provided an easy means of transportation. During the 1830s more people settled in Downsview. It was often difficult. For example, when William Jackson and his wife, Jane Duncan, set out for their farm on the west side of Keele, their wagon became mired in the mud crossing a small creek just north of Lawrence Avenue West. They were extricated by local residents, the Clarkes and Gouldings. Not long after John Boake and his new bride Rebecca Bull, became stuck in the mud with an ox-driven wagon filled with bedding, dishes, utensils, sugar, soap, salt, flour, hammer and nails, and other supplies. Once again the Clarkes and Gouldings came to the rescue. Mrs. Goulding brought a frying pan, buckwheat flour and maple syrup to make pancakes for eating after the men pulled out the wagon.